We’ve been selling eggs from our free range hens since 2003. Because of their varied, natural diet, our hens produce eggs with bright, plump yolks, and whites that ‘stand’; they have excellent flavour. They are ideal for all culinary purposes. If the honesty box isn’t there, or you fancy a blether, come to the house and we’ll probably have some available there. If you wish to place a regular order please contact us or come to the house and we will put eggs aside for you each week. We keep around 100 hens in three small flocks. We replace one flock each spring. The two youngest flocks each has its own house plus three paddocks, planted with apple trees and herbaceous plants. The hens move to a new paddock every month, so they can access fresh, clean grass. Each hen has approximately 30m2 of outdoor space. Our eggs are not graded – most would be classed as large or extra large. Every year around May/June we have pullet eggs for sale – these are the smaller eggs from young hens who have just started laying. The eggs are sold in boxes of six, and may vary in shell colour – we have breeds that lay white, light brown, dark brown, and blue/green eggs. The oldest hens flock of hens free range across our fields from their home in a converted caravan. The hens have adlib access to a layer pellet plus a “treat” of mixed corn in the afternoon – plus, of course, grass and seeds and bugs that they find as they scratch around. 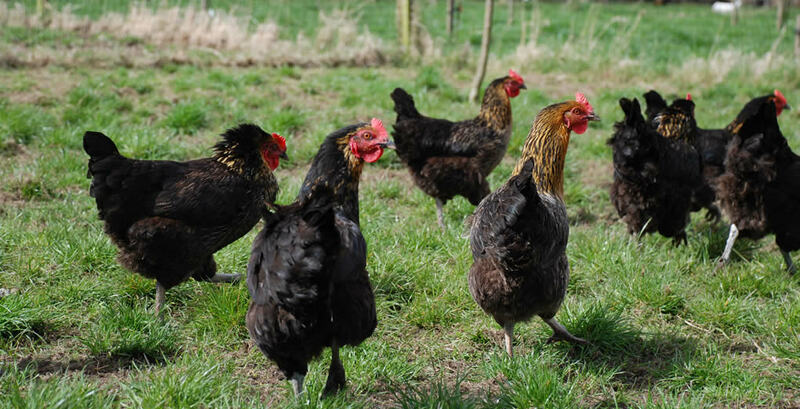 Our hens are mostly Rhode Rocks, with a scattering of other types – Hyline, Marans, White Leghorns. Eggs are collected every day and prepared for sale. Although we advise customers to eat within three weeks, the eggs we sell are rarely more than two or three days old.